Responding to images and landscapes of war and conflict, Hillary Mushkin’s Incendiary Traces project began as an LA Forum online gallery in 2011. In honor of the current Incendiary Traces exhibition at the Pomona College Museum of Art, we talked with Mushkin about the project’s evolution. What was the genesis of this project and partnership with the LA Forum? When LA Forum Board member Gloria Lee invited me to do a project for the LAF gallery, I had been working on animation and drawing projects for several years that pictured Los Angeles as a war zone. Their impetus stretches back to 2003 when the George W. Bush administration began talking about bombing Baghdad, which incited memories of the 1991 US Baghdad bombing media coverage. Specifically, CNN’s green night scope footage which was shot from a distance, framing a sky filled with the abstract missile fire lights, almost like a fireworks show, and I wondered if the new Baghdad bombing would be represented similarly. Inspired by this, I created a video project called the Sleep of Reason in 2003-2004 that brought together hand-traced animation of the CNN footage with reversed footage of Fourth of July fireworks from my Cypress Park neighborhood. Through hand-tracing, I sought to engage, in an embodied manner, with a remote war that I felt some responsibility to address as a US citizen. In 2011, when Gloria invited me to do the LA Forum online gallery, the US had been engaged in Middle East war for almost a decade. I returned to the project, recognizing that architects, like artists, are professionally trained to imagine landscapes and understand them as places where people live. I thought we could work together to make a connection between landscape, specifically, a war zone, as a pictured and lived environment. How has the project evolved between 2011 and the current Pomona College Museum of Art exhibition? For the LA Forum online gallery, I wrote a text and made some drawings that visually attempted to overlay Cypress Park onto Baghdad. The text included the question, could we reverse-engineer the image of a palm-dotted landscape to connect Los Angeles with this distant war? 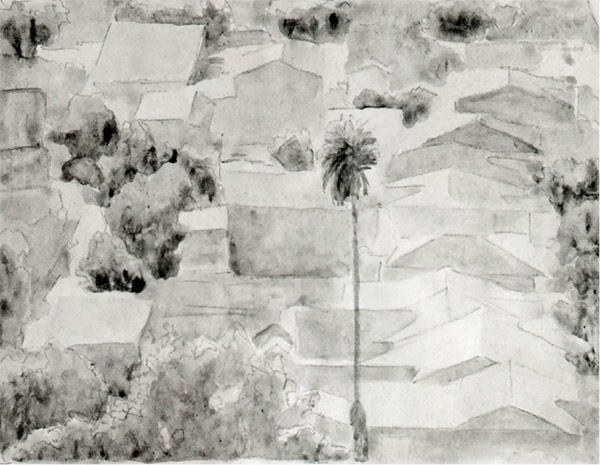 I began drawing with a group of artists outside the Los Angeles Air Force Base in El Segundo. Their public affairs office thought we should be more interested in drawing aircraft and landing strips, but the mundane side of war was in fact our interest. When the Department of Defense police asked us not to draw their gated driveway it prompted a dialog about observation, drawing, and authority; which was the inspiration for what came after. At that time Juan Devis was launching KCET’s cultural journalism program Artbound and invited me to collaborate. This created a broader opportunity to present alternative approaches to visualizing war zones as well as share historical and contemporary insights from scholars and others on the subject. Since then I have organized about ten drawing events and published materials on the various ways militaries and paramilitaries visualize conflict zones — all of which is part of the current exhibition.